"In the South they are convinced that they are capable of having bloodied their land with history. In the West we lack this conviction." In the process of setting up this blog, I felt the need to designate some of the folks whose work shows up here as Honorary Southern Photographers. 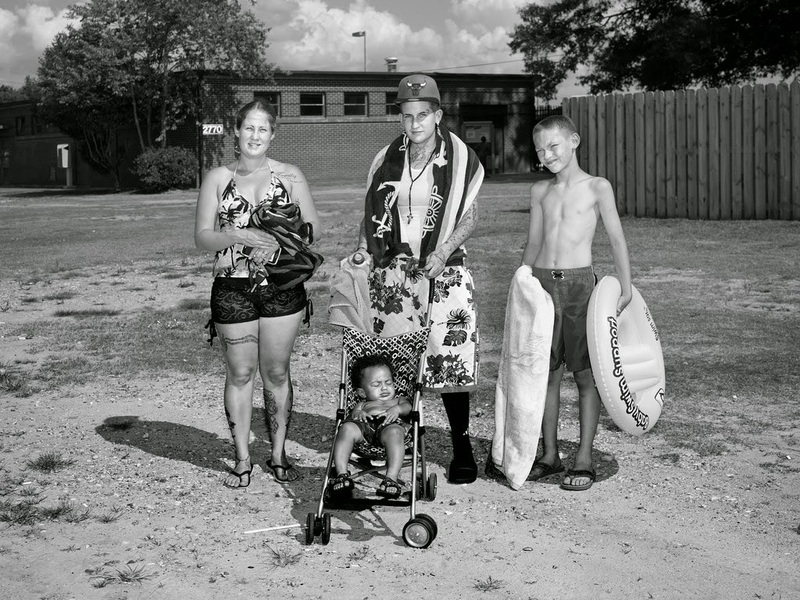 These are photographers who are Not From Around Here, as we say, but who engage in their work with the complex narratives and experiences of family, race, gender, class, and economic exploitation that constitute the legacy of Southern history for Southerners, seeking to make meaning out of that legacy in the present-day South. These issues are at the heart, for example, of the writings of William Faulkner, especially that group of novels -- Go Down, Moses, The Sound and the Fury, As I Lay Dying, Light in August, and Absalom, Absalom -- that I believe represent his most enduring achievements. Over the years the list of Honorary Southern Photographers has grown to include, among others, folks like Carrie Mae Weems, Dana Mueller, Dawoud Bey, Eugene Richards, Magdalena Solé, and Myra Greene. 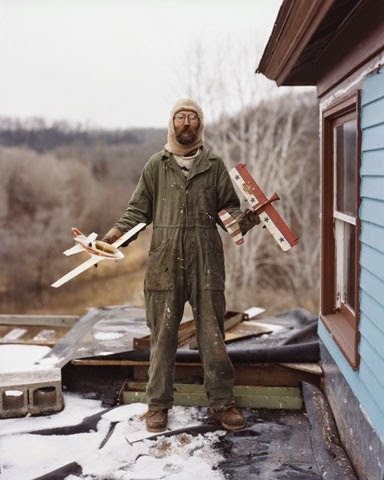 This list does not include, however, the name of Alec Soth, even though he has worked in the South on more than one occasion. He did some, although not nearly the majority, of the images in his signature Sleeping by the Mississippi portolio in the South. He did a portfolio of work for the High Museum in Atlanta as part of their ongoing "Picturing the South" series, back in 2009. Long-time readers of the blog will remember that I was not happy with Soth's work for the High Museum. His work on that commission seemed to me then, as it still does to me now, superficial and derivative, trying through technique to elevate the quirky, the random, and the bizarre to the level of the profound. Samples of Soth's more recent work published recently in the New York Times do nothing to change my mind. The back story for this body of work, however, clarifies Soth's working method in ways that help me understand my response to his work. Turns out, Soth made this work -- all in the state of Georgia -- in a two-week period, during which Soth and his buddy, writer Brad Zellar, traveled over 2400 miles. So, a flying trip -- that's an average of nearly 200 miles a day, which reminds me of the old joke about someone on those old package tours of Europe, where you were promised you would see it all, seven countries in seven days. So, the inevitable question is, "Where are we?" to which the answer is, of course, "I don't know, but since its Thursday, it must be Belgum." Well, in this case, every day it was somewhere in Georgia, but unlikely to have been the same place two days in a row. But what helped these guys was, they knew what they were looking for before they went. The title of the NY Times portfolio draws, of course, on language that is part of a whole tradition of cliches about the South. It is "Southern Gothic: Hunting for the peculiar soul of Georgia." As Zellar points out in a sidebar interview, he and Soth were looking for the "peculiar" in Georgia, starting from the assumption that the complex state of Georgia has a single "soul," and that the soul of Georgia is peculiar, and that they could find that peculiarity. Zellar says, "The South was a source of fascination [for me] from a very early age, and by the time I was in high school, I had keyed in on Georgia as a confounding, fascinating and almost mythical place." To Zellar, Georgia was "weird, contradictory." So, Georgia is "Gothic," "peculiar," "confounding," "mythical," "weird," and he's known it was that way for him since he -- and Soth -- were in high school in Minnesota. Thing is, Soth has built a career on being able to find the "peculiar" and "weird," even in Minnesota, witness the image above. He certainly does not need to be in Georgia to do so. But now he is 42 (this whole trip was part of a birthday celebration for Soth at 42), and he's learned what to photograph to help advance his career, and since he knows that's what he wants to photograph, that's what he will find when goes out to photograph. Especially if he is covering 2400 miles in two weeks. Not much time there to look around, to be surprised, to engage deeply and responsibly with the people he meets. 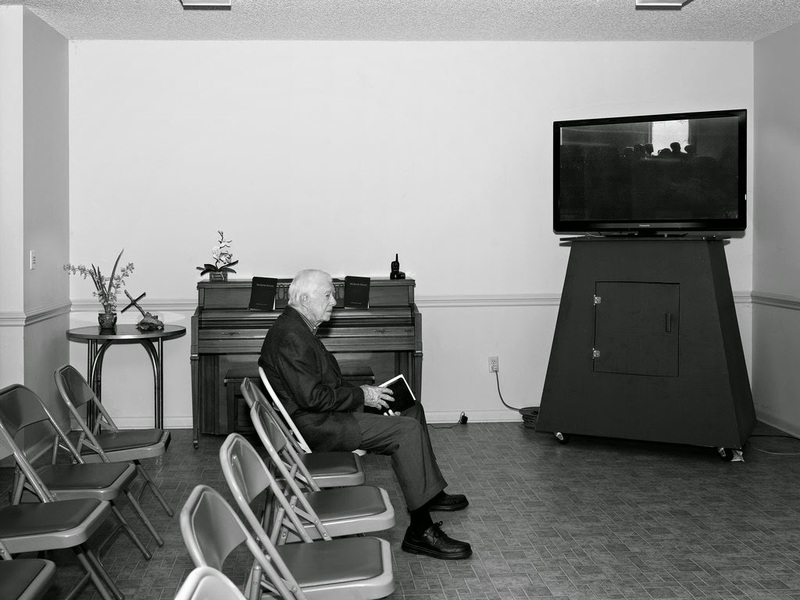 Some of Soth's photographs in this portfolio suggest that he ran across people with interesting stories to tell, or situations to account for, or understandings to disclose, but we won't find that kind of engagement or respect or concern in this work. Strange thing is, in Zellar's comments there is the core of a real idea. He notes that in Georgia we've got "the whole history of the country played out there at one time or another: the Revolutionary War, slavery, the Civil War, the Great Depression, the civil-rights movement and the Rev. Dr. Martin Luther King Jr."
Zellar says, they found in Georgia "incredible poverty and segregation and . . . bastions of immense wealth." Sounds like Georgia is therefore the Real America in microcosm, or, the words of Arlo Guthrie, "Good morning, America, how are you? Don't you know me, I'm your native son." So there is here, an idea, of Georgia as what it really means to be America. But Georgia persists, for Zellar, and therefore, presumably for Soth as well, to be "an entirely different planet from the world I was familiar with . . . absolutely nothing like any of the other states we visited." This is, in microcosm, the conundrum of the South, to be the most quintessentially American place in America, yet for America at large to remain "an entirely different planet . . . absolutely nothing like any of the other states." 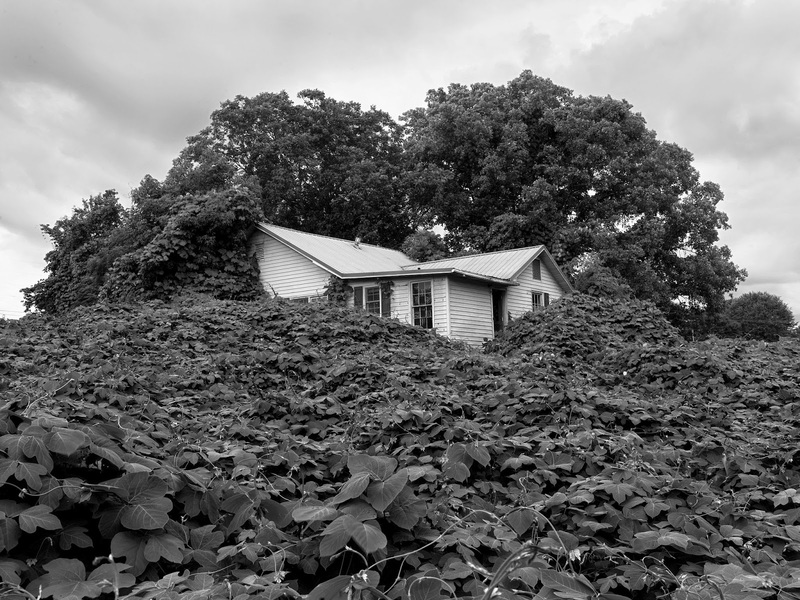 Soth's work in the South shows us surfaces and cliches (how many more photographs of kudzu about to overwhelm the built environment do we really need? ), seeks to make peculiar what is to us ordinary, demonstrates in his work down here the same capacity he showed in his early work of finding the quirky and the sad, whether he is in Minnesota or Georgia. There is no denying that Soth is a very skilful and successful photographer. 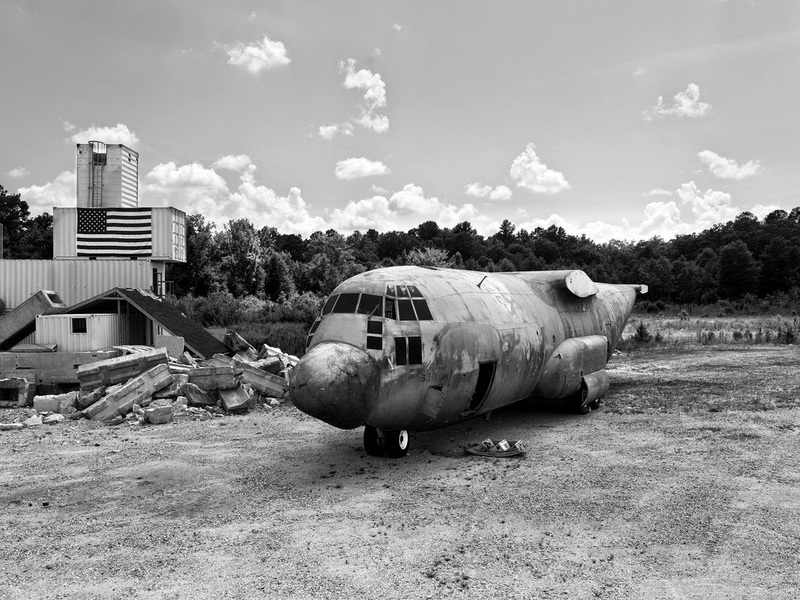 In spite of his success, however, Soth continues to contribute to cliched images of the South. I'm sure he doesn't care, but for those reasons, Alec Soth is unlikely to join my list of Honorary Southern Photographers. Although not related to photography, the whole issue reminds me of an experience I had while taking a year of wooden boatbuilding in Morehead City, North Carolina. The instructors were from Harkers Island, a place so remote that they still spoke with a local brogue there. When we got to the part where we had do build the stems of our boats, the instructors gave us the names of a couple of people who might have some suitable heart pine. At the next boat building session one fellow reported that he went where told, but was not able to buy a piece of wood. Frank, the instructor, asked him, 'well, did you talk to the guy before you asked for the wood?' No, was the answer. Exasperated Frank said, around here you can't just go and ask the guy for wood, you got to talk to him, tell him who you are, what you are planning to do with the wood, spend some time letting him get to know you! IMHO: Soth's work misses the point, but your critique does not. Do you have a digitizing service? I had a bunch of printed photos from my parents wedding that I had digitized by ScanDigital. I finally don't have to worry about them deteriorating. I'm a photographer, a writer, and a teacher at NC State University.